Queen’s University Belfast (currently based at the NASA GSFC). Since its launch in February 2010, the Atmospheric Imaging Assembly (AIA) onboard the Solar Dynamics Observatory (SDO) has been producing high-resolution, full-disk images of the Sun in ten wavelength bands every 12 seconds. Seven of the ten passbands are tuned to observe emission in the extreme ultraviolet (EUV; 94Å, 131Å, 171Å, 193Å, 211Å, 304Å, and 335Å) and each contains emission lines formed at distinctly different temperatures, as shown in a previous nugget which used synthetic spectra from CHIANTI  to determine which lines dominate the AIA images under different conditions. However, recent work  has suggested that, during large solar flares, some of the AIA channels might also be sensitive to emission from free-free (thermal bremsstrahlung) continuum. Knowledge of which emission processes dominate the images under different conditions are crucial for interpreting the data correctly. The EUV Variability Experiment (EVE), also onboard SDO, acquires full disk (Sun-as-a-star) EUV spectra every 10 seconds over the 60-370Å wavelength range using its MEGS-A (Multiple EUV Grating Spectrographs) component with a near 100% duty cycle. 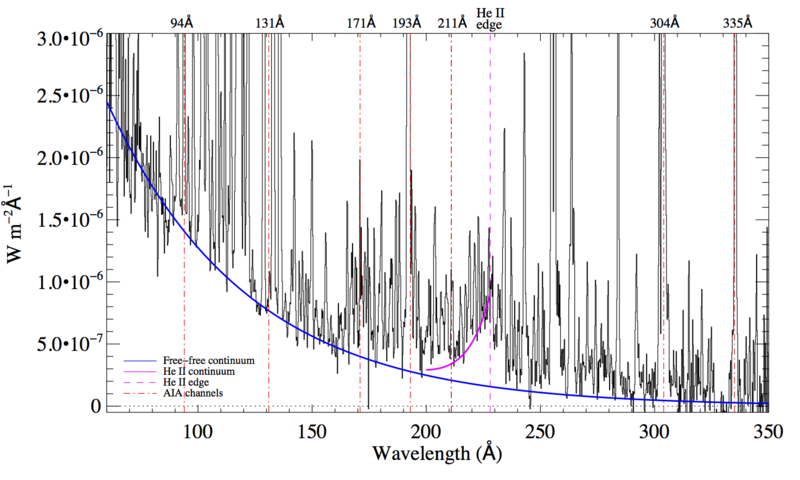 As the MEGS-A wavelength range contains each of AIA’s EUV passbands (vertical dot-dashed red lines in Figure 1) it is now possible to quantify the continuum contributions to each channel during solar flares by convolving the observed EVE spectra, rather than a synthetic one, with the AIA response functions. This not only removes any assumptions about the physical conditions of the emitting plasma, but also allows the relative continuum contribution to be determined as a function of time throughout a flaring event. Figure 1: Background-subtracted EVE spectrum over the 60-350Å wavelength range taken near the peak of the X-class flare on 15 February 2011. Overlaid in blue is the fit to the free-free continuum, while the purple curve denotes the fit to the He II continuum blueward of the recombination edge at 228Å (vertical dashed purple line). The vertical red dot-dashed lines are positioned at the central wavelength of each AIA passband. Figure 1 shows the observed EVE MEGS-A spectrum, with the blue and purple lines giving the determined free-free continuum and He II free-bound (recombination) continuum in blue and magenta respectively. To determine the free-free continuum it was assumed that the lower envelope of the EVE flare spectra would best define the free-free continuum at any given time. The the local minima in the spectrum were identified by taking the first and second derivatives of the EVE spectra, and the resulting wavelengths and intensities fit with an exponential function. A similar procedure was carried out for the He II free-bound continuum, which straddles the 211Å passband. Both the pre-flare subtracted EVE data and the fits to the underlying continua were convolved with the AIA response functions throughout the course of the flare to yield a measurement of the relative continuum contribution to each channel. Lightcurves of the total emission predicted for each AIA channel were compiled for the 15 February 2011 X-class flare for each AIA EUV passband (except 171Å) as shown in Figure 2 (solid black curves in the upper panels). The corresponding line (red) and continuum (blue) time profiles are also plotted, as well as the He II continuum (purple) in the case of the 211Å channel (panel d). To enable easy comparison, the relative contribution from both line and continuum emission are shown in the lower panels of each plot. Typically, 10-25% of the observed emission in the 94Å, 131Å, 193Å and 335Å channels was deemed to be continuum emission throughout the main phase of the flare. Results were inconclusive for the 171Å channel, and the continuum contribution to the 304Å was found to be negligible due to the presence of the strong He II line. The 211Å channel however, was found to contain as much as 50% free-free continuum, as well as an additional 20% of free-bound He II emission around the peak of the flare. 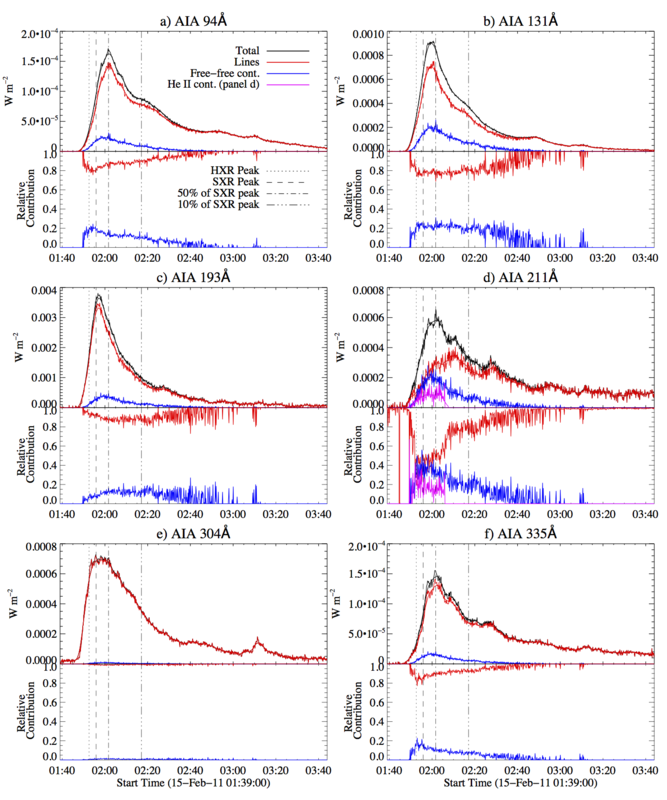 Figure 2: Lightcurves of the predicted emission in each of the AIA channels (except 171Å) during the 15 February 2011 flare. Upper panels: Total emission in each passband (black), free-free continuum (blue), and line emission (red). In panel d the time profile of the free-bound emission from He II is also shown (purple). Lower panels: Relative contributions of free-free continuum (blue), line emission (red), and He II continuum (purple, panel d only). The vertical dotted, dashed, dot-dashed, and triple-dot-dashed lines denote the times of the peak of the GOES derivative (a proxy for the HXR peak), the peak of the SXR emission, and points in the X-ray decay phase when the flux was 50% and 10% of the maximum, respectively. The analysis performed on the 15 February 2011 flare was repeated for a number other M- and X-class flares. Figure 3 shows how the continuum contribution to each channel varies as a function of GOES class at the SXR peak of each event. For the 193Å and 304Å channels the continuum contribution does not change appreciably with respect to GOES class, with both channels exhibiting less than 10% continuum emission. The 94Å, 131Å, and 335Å channels show a slight dependence on X-ray classification but still contained less than 20% continuum emission in all but the largest events. The 171Å and 211Å channels, however, both reveal a strong correlation between continuum contribution and peak X-ray flux. This is due to the primary emission lines in each of these channels (Fe IX and Fe XIV, respectively) becoming inherently weaker during flares as plasma initially at these temperatures is heated to higher ionisation states. Therefore the relative intensity of the underlying continuum increases. There is also the possibility of depletion of material at these temperatures due to coronal dimming as large flares are often associated with CMEs. 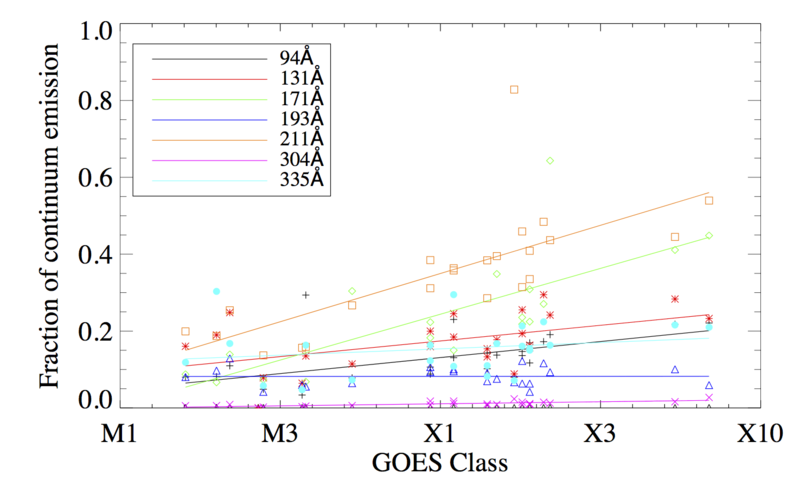 Figure 3: Plots of the continuum contribution to each of the AIA channels as a function of GOES class at the time of peak SXR emission. The availability of concurrent AIA and EVE observations now allow the precise spectral content of AIA images under different solar conditions to be determined using observed, rather than synthetic spectra (which often requires the imposition of several assumptions). Both this and previous work  show that the 171Å and 211Å channels exhibit the largest contribution of free-free continuum emission during flaring conditions. Continuum contributions to many of the other channels can also be non-negligible . So the findings presented here underscore the need for coordinated spectral and imaging data to correctly interpret AIA flare observations.